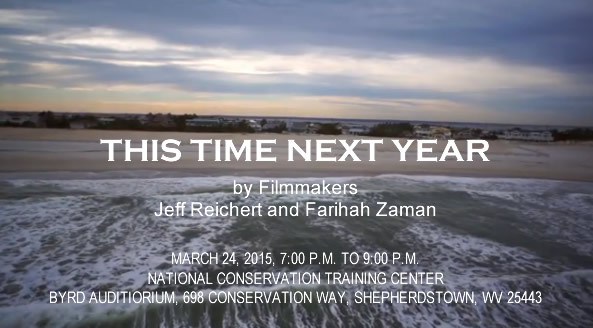 Friends of the NCTC - For Friends Members and their Guests: Film Screening of "This Time Next Year"
For Friends Members and their Guests: Film Screening of "This Time Next Year"
March 24, 2015, 7:00 p.m. to 9:00 p.m. THIS TIME NEXT YEAR tracks the resilience of the Long Beach Island, NJ community for one year as they rebuild after 2012’s Hurricane Sandy. Using a mixture of veriteì, first-person accounts, and the residents’ own footage, THIS TIME NEXT YEAR is a poetic documentation of a shore community as they battle local politics, cope with personal tragedy, and band together in the face of transition. Our goal is to use This Time Next Year to help make people, communities and systems better prepared to withstand natural catastrophic events, bounce back quickly and emerge stronger from these shocks and stresses. Please register at least 48 hours prior to the event.